England's bid to reach the Champions Trophy final for the first time is over after they drew 2-2 with New Zealand and Argentina beat China 4-3. 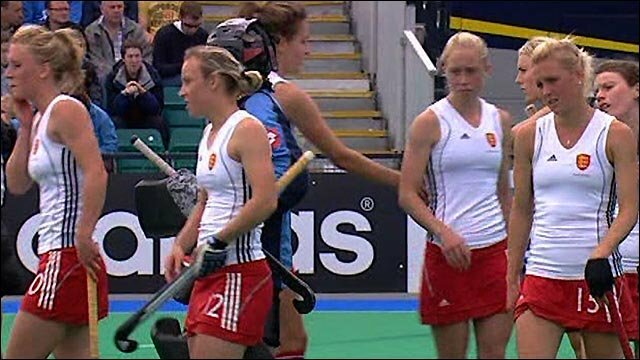 England were 2-0 down before Nicola White and Crista Cullen rescued a disappointing draw in Nottingham. That meant the hosts needed China to avoid defeat, but a late score sent Argentina through on goal difference. England now face Germany on Sunday in a battle for bronze, before Argentina play Netherlands in the final. "Today has been horrendous on many levels," England head coach Danny Kerry told BBC Sport. "I don't know what to say. It's been awful. We were all over New Zealand like a rash in the first five minutes. "We had a bad 15-minute spell and that cost us, but we had more than enough chances to win the game." The Dutch booked their place in the final in Saturday's opening game, beating Germany 1-0, and will be clear favourites to lift the trophy. The tournament, which pits six of the world's top teams against each other, ranks behind only the Olympics and World Cup in terms of importance, and is being staged in England for the first time. The home side, occasional participants in the past, have never previously finished higher than fifth, and had won just one of their 18 Champions Trophy fixtures prior to the start of the 2010 tournament. In Nottingham the team have at least matched their initial ambition to finish in the top four, but, having come so close to reaching the final, settling for the bronze medal play-off will feel like failure. New Zealand had lost all four of their matches coming into Saturday's game, but England started shakily and Pikki Hamahona waltzed through almost unchallenged to put the Black Sticks a goal up after just seven minutes. Gemma Flynn made that two, tidying up a rebound as England again looked weak at the back, before Charlotte Craddock's excellent break down the right handed White the easiest of finishes to get England back into the tie. The talismanic Cullen, who limped off with a knee injury earlier in the game, then returned from the sidelines in time to fire England back onto level terms with a fine finish to a penalty corner move, low into the right-hand corner of the net. England began the second half looking strong, making particularly good use of long-range passes, but no straightforward chances for a winner presented themselves as the teams became entrenched in a frustrating midfield skirmish. England squandered a last-second penalty corner which could have booked their berth in the final, then were powerless as they watched Argentina play China. The energetic Chinese knew their tournament was already over, but fought back from 3-1 down to 3-3 before a dramatic Noel Barrionuevo goal won the game. Barrionuevo scored from a contentious late short corner, awarded by English umpire Frances Block, who penalised a Chinese defender for failing to remove her protective facemask quickly enough following an earlier set piece. The Netherlands have lived up to their billing as world and Olympic champions so far but they lost 4-2 to Argentina on Thursday, which will give the world number two Argentines hope of an upset in the final. England were victors over Germany earlier in the tournament and a bronze medal in Sunday's game, which starts at 1220 BST, would be some reward after what has been their most successful Champions Trophy appearance. Crowds have picked up for the weekend's action despite howling winds in Nottingham, with England Hockey declaring Saturday a sell-out of the venue - which has a capacity of just over 3,000 - and operating a "Wimbledon-style" ticket reselling scheme at the gate. Many England supporters stayed on after the New Zealand draw to back the Chinese as their team's fate hung in the balance.